Explore Scientific 1.25" UHC Nebula Filter. Range from 458nm to 508nm with peak at 488nm. Peak transmission 96.7%. Item # 310215. One of the most important obstacles for the exploration of the night sky is the brightening of the night sky by artificial lights such as streetlights. The night sky is not really dark in the vicinity of towns or cities, which reduces the visibility of objects beyond the solar systems enormously. Depending on the type of the celestial object it is possible to increase the contrast dramatically by blocking the annoying artificial light. 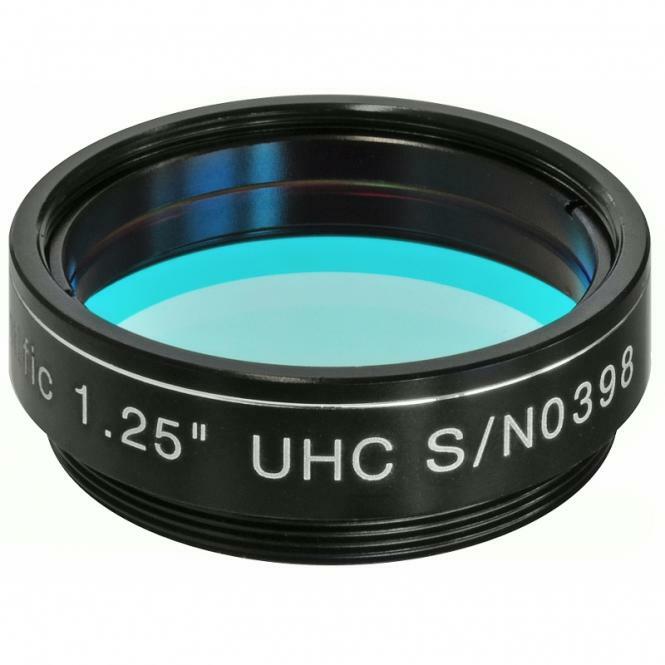 The Explore Scientific UHC filter uses a characteristic property of the so called emission nebulae. Those objects glow in special colors, the so called emission lines. Those emission lines are linked to chemical elements - in this case hydrogen at 486nm and 656nm, plus oxygen at 496nm and 501nm. The Explore Scientific UHC nebula filter blocks all other colors (and thereby nearly all of the artificial light) and only the emission line of the hydrogen and oxygen can pass the filter. The result is astonishing: suddenly nebulae are visible at locations that were completely empty without filters. In suburban skies for example, the Owl Nebula M97, the Veil Nebula NGC 6992 or even the bright Dumbbell Nebula M27 are not clearly visible. By using this filter you can see the nebulae and their structures without problems.